For example we can restrict our analysis to just “humans” residing in the UK. We can further ignore viewers that are not interested in our site; they visit just one page and leave. That leaves us with just “UK Engaged Visitors”. New Visitors: These are visitors we have never seen visit the site before. Returning Visitors: Visitors that have visited the site on a least one previous occasion. Bounce rate: A measure of how interested a visitor was. A 100% bounce rate equates to visitors who take one look and leaves, 0% equates to visitors who spend time looking around the site, viewing multiple pages. All of this information is collected and then filtered for visitors residing in the UK. It should be noted that if a new visitor returns within a calendar month, then Google counts them as both a new AND returning visitor. 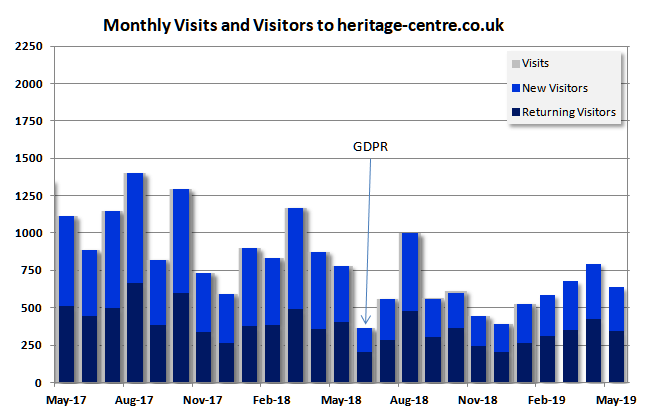 By using the total number of visitors we can work out how many of the returning visitors were new that month and how many have been to the site in previous months. Note: Since the start of June 2018, following the introduction of GDPR, we have allowed visitors to reject non-essential (i.e Google Analytic) cookies. This has resulted in around two thirds of visitors no longer being tracked. From server data, visits in June 2018 were similar to, if not higher than, April 2018.